Our student intern, Jonathon Breithaupt, has a passion for trees. 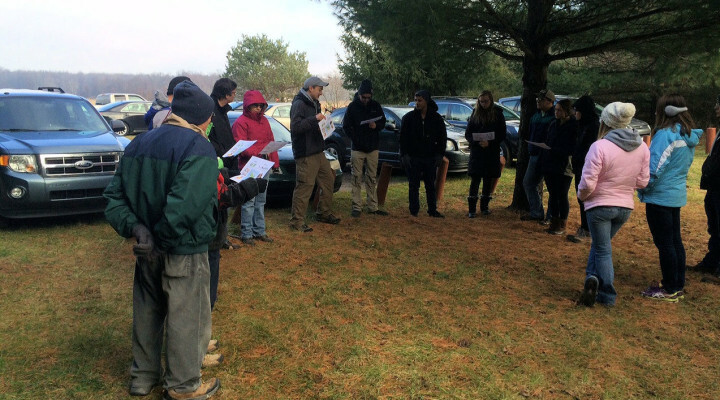 On Saturday, December 5th, he led his second annual winter tree identification walk at Sylvan Solace Preserve. An interested group of 18 participants made the leisurely walk of the main trail system while studying the various tree species encountered. Jonathon’s key sheet handout helped beginners get started, and he added his own tips and pointers about identification. Most conifers are at least consistent, in that they are evergreen throughout the year (tamarack, or larch are an exception in Michigan, as they actually drop their needles in winter), so checking numbers, length and stiffness of needles on coniferous trees made for easy comparison to a key sheet. But deciduous trees have already dropped their leaves. In some cases identification was relatively simple by observing the leaves dropped to the forest floor. But Jonathon also talked about using other references in winter to identify trees, including bark color and texture, twig structure and nuts or fruit. There is always something interesting during a walk at Sylvan Solace, but the chance to learn about tree identification nuances after the leaves drop is an added bonus. Don’t miss another opportunity to see Sylvan Solace at a special time of year when we welcome the winter solstice during an early morning walk on December 21st.